"They are VERY home-made tasting. It was very nice to look at the ingredients and not see 4 or 5 lines of preservatives." We start with the finest ingredients to bake a sugar cookie that your grandmother would be delighted to serve. 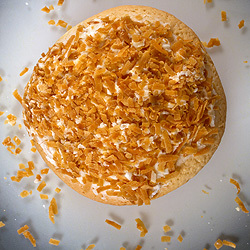 Then we ice these delicious cookies with our freshly made buttermilk icing and top with delicious coconut. 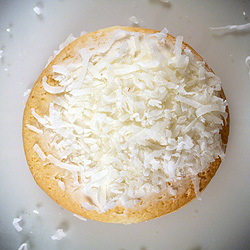 These soft cake baked coconut iced sugar cookies are perfect any time and make a great accompaniment to coffee, tea or milk. © 2019 Choanie's Bakery, Inc. - All Rights Reserved.